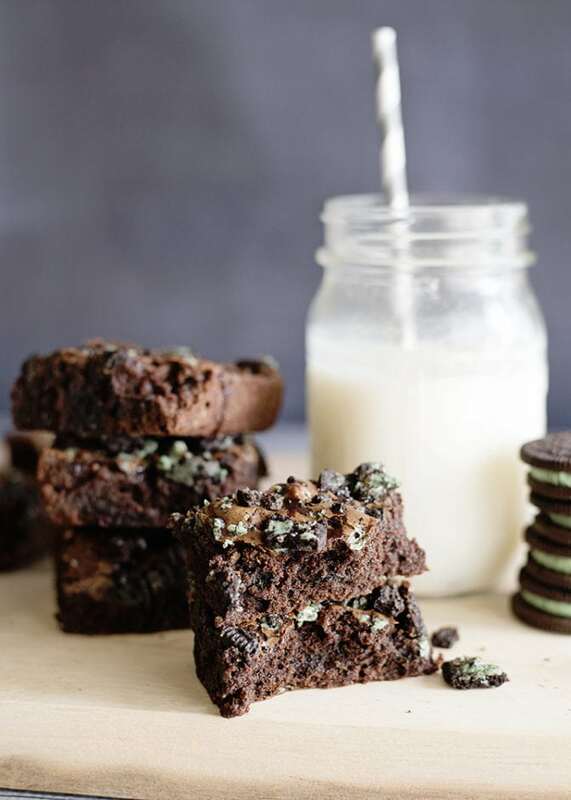 St. Patrick’s Day is just a few days away and while I’m not always big into holiday themed food – with the exception of Christmas, of course, these Mint Oreo Brownies are perfect for celebrating the luck o’ the Irish or just any ol’ day, too! Scratch made brownies (which are crazy easy) are filled with broken Oreo cookies (y’all know those are my favorite). To add a little festive color and flavor, we add Mint Oreos! Yes, please! I just love the little pop of mint these have. It’s great without being overpowering. 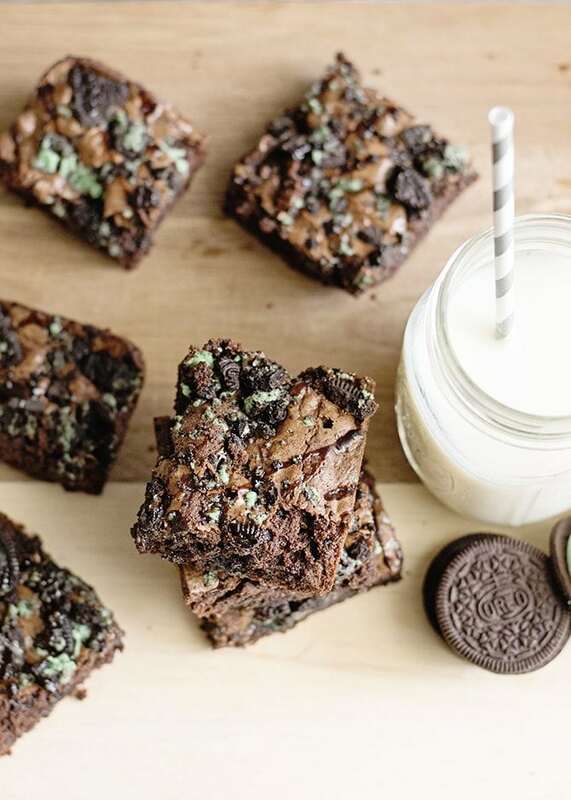 And while a boxed brownie mix is super easy and pretty dang delicious (I love those Ghirardelli brownie mixes! ), you seriously won’t believe how easy it is to make them from scratch. Serve them up with a glass of ice cold milk, and you’ve got a fun after school snack to serve the kiddos on St. Paddy’s day. They’re also mad delicious with a big ol’ scoop of vanilla ice cream right on top… but I didn’t say that. Who are we kidding? Yes I did! Preheat the oven to 350°F and lightly spray an 8x8-inch baking pan with nonstick cooking spray. In a small bowl, combine the oil, sugar, eggs and vanilla. Mix well. In another bowl, mix together the baking powder, cocoa powder, salt and flour. Pour the wet ingredients into the dry and mix until well combined. Place the Oreos in a zip-top bag and break them up. You want chunks, not crumbs. Add about half of them to the batter and fold in. 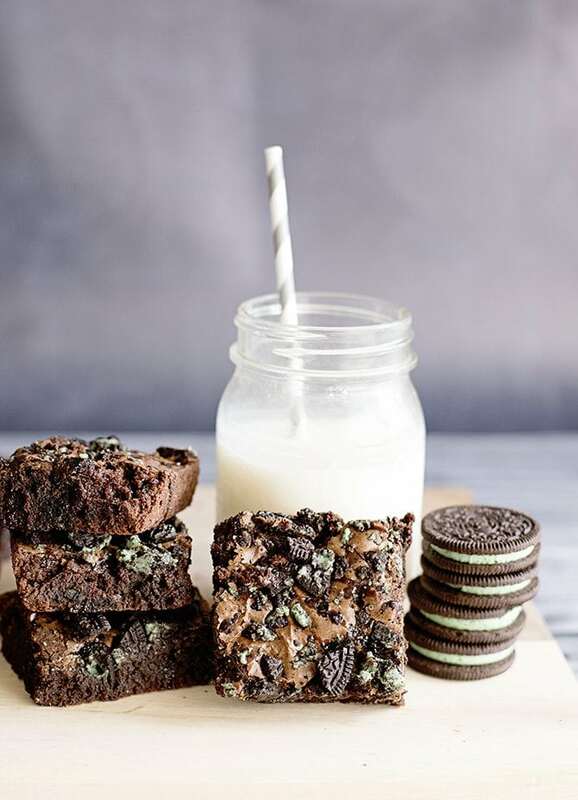 Pour into your prepared baking pan and sprinkle the remaining Oreos on top. Bake for 25 to 30 minutes. The edges should be set and the middle should look moist, but not too jiggly. Cool completely before cutting. 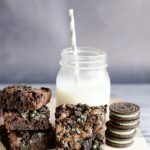 Made this several months ago with the mint Oreos—AMAZING! Going to try this with peanut butter Oreo cookies for my “Reeces-loving” hubby tonight!